A family with rickets. Paris, 1900. Rickets, or rachitis, is a childhood deficiency disease characterized by defective bone growth resulting from lack of vitamin D or calcium. Insufficient sunlight can be a contributing factor, due to its role in the synthesis of vitamin D.
Rickets is among the most frequent infant and childhood diseases in many developing countries. The softening of the bones in children due to improper deposition of calcium in the bones, and potentially can lead to fractures and deformity, such as stunting and curving of the bones. Osteomalacia is the equivalent disease in adults (Bender and Bender 2005). Rickets largely is a preventable disease, through consuming adequate amounts of calcium and getting sufficient sunlight or adequate dietary vitamin D. On a personal level, this requires taking responsibility for one's diet and the diet of one's children. Socially, this reflects on the need for public education, the importance of fortifying foods (such as milk with vitamin D) and the responsibility to assist those in developing countries to get the proper nutrition. The word "rickets" comes from the word "rachitis," meaning wrist (and also spine), as wrist deformities are common and obvious in rickets. Vitamin D is a group of fat-soluble prohormones; that is, a substance that has no hormone activity itself, but is converted to a hormone. While there are several forms, the two major forms are vitamin D2 (or ergocalciferol) and vitamin D3 (or cholecalciferol). (The term vitamin D also refers to metabolites and other analogues of these substances.) Vitamin D2 is derived from fungal and plant sources, and is not produced by the human body. Vitamin D3 is derived from animal sources and is made in the skin upon exposure to sunlight (specifically when 7-dehydrocholesterol reacts with UVB ultraviolet light at wavelengths between 270–290 nm) (Norman 1998). Although classified as a vitamin—an organic (carbon-containing) nutrient obtained through the diet and essential in small amounts for normal metabolic reactions—Norman (1998) notes that vitamin D3 is not really a vitamin in that it is not essentially a dietary factor, but rather produced photochemically in the skin. Vitamin D promotes bone formation and mineralization and is essential in the development of an intact and strong skeleton. Vitamin D deficiency can result from inadequate intake coupled with inadequate sunlight exposure; disorders that limit its absorption; conditions that impair conversion of vitamin D into active metabolites, such as liver or kidney disorders; or, rarely, by a number of hereditary disorders (Merck 2005). Rickets, a childhood disease characterized by impeded growth, and deformity, of the long bones. Osteomalacia, a bone-thinning disorder that occurs exclusively in adults and is characterized by proximal muscle weakness and bone fragility. Osteoporosis, a condition characterized by reduced bone mineral density and increased bone fragility. The role of diet in the development of rickets was determined by Edward Mellanby between 1918 and 1920 (Rajakumar 2003). In 1921, Elmer McCollum identified an anti-rachitic substance found in certain fats that could prevent rickets. 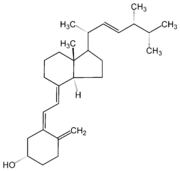 Because the newly discovered substance was the fourth vitamin identified, it was called vitamin D (Rajakumar 2003). The 1928 Nobel Prize in Chemistry was awarded to Adolf Windaus, who discovered the steroid, 7-dehydrocholesterol, the precursor of vitamin D.
Prior to the fortification of milk products with vitamin D, rickets was a major public health problem. In the United States, milk has been fortified with 10 micrograms (400 IU) of vitamin D per quart since the 1930s, leading to a dramatic decline in the number of rickets cases (Holick 2004). A rare X-linked dominant form exists called Vitamin D resistant rickets. The predominant cause of rickets is a vitamin D deficiency, but lack of adequate calcium in the diet may also lead to rickets. Although it can occur in adults, the majority of cases occur in children suffering from severe malnutrition, usually resulting from famine or starvation during the early stages of childhood. Individuals with red hair (who also generally have extremely pale skin that burns rather than tans) have a decreased risk for rickets due to their greater production of vitamin D in sunlight (ED 2007). 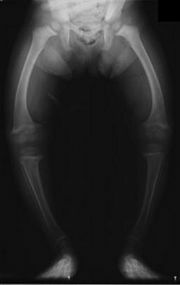 Radiograph of a two-year old rickets sufferer, with a marked genu varus (bowing of the femurs) and decreased bone opacity, suggesting poor bone mineralization. Older children: Knock-knees (genu valgus) or "windswept knees"
Tetany (uncontrolled muscle spasms all over the body). An X-ray or radiograph of an advanced sufferer from rickets tends to present in a classic way: Bow legs (outward curve of long bone of the legs) and a deformed chest. Changes in the skull also occur causing a distinctive "square headed" appearance. These deformities persist into adult life if not treated. Long-term consequences include permanent bends or disfiguration of the long bones, and a curved back. Serum calcium may show low levels of calcium, serum phosphorus may be low, and serum alkaline phosphatase may be high. X-rays of affected bones may show loss of calcium from bones or changes in the shape or structure of the bones. Bone biopsy is rarely performed but will confirm rickets. A sufficient amount of ultraviolet in sunlight each day and adequate supplies of calcium and phosphorus in the diet can prevent rickets. Darker-skinned babies need to be exposed longer to the ultraviolet rays. Vitamin D is essential for allowing the body to uptake calcium for use in proper bone calcification and maintenance. Baring exposure to ultraviolet rays to produce vitamin D, good sources of vitamin D are Cod liver oil, halibut-liver oil, and viosterol. Recommendations are for 200 international units (IU) of vitamin D a day for infants and children. Children who do not get adequate amounts of vitamin D are at increased risk of rickets. Sufficient vitamin D levels can be achieved through dietary supplementation. 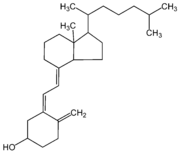 Vitamin D3 (cholecalciferol) is the preferred form, since it is more readily absorbed than vitamin D2. Most dermatologists recommend vitamin D supplementation as an alternative to unprotected ultraviolet exposure due to the increased risk of skin cancer associated with sun exposure. According to the American Academy of Pediatrics (AAP), infants who are breast-fed may not get enough vitamin D from breast milk alone. For this reason, the AAP recommends that infants who are exclusively breast-fed receive daily supplements of vitamin D from age 2 months until they start drinking at least 17 ounces of vitamin D-fortified milk or formula a day. Treatment of rickets involves increasing dietary intake of calcium, phosphates, and vitamin D. The replacement of vitamin D has been proven to correct rickets using ultraviolet light therapy and medicine (Rajakumar 2003). Edinburgh Dermatology (ED). 2007. Red hair genetics. University of Edinburgh Department of Dermatology. Retrieved August 4, 2007. Grant, W. B., and M. F. Holick. 2005. Benefits and requirements of vitamin D for optimal health: A review. Altern Med Rev 10(2): 94-111. Holick, M. F. 2004. Sunlight and vitamin D for bone health and prevention of autoimmune diseases, cancers, and cardiovascular disease. American Journal of Clinical Nutrition 80(6): 1678S-1688S. Merck. 2005. Vitamin D. The Merck Manual of Diagnosis and Therapy]. Retrieved August 4, 2007. Norman, A. W. 1998. Sunlight, season, skin pigmentation, vitamin D, and 25-hydroxyvitamin D:integral components of the vitamin D endocrine system. Am J Clin Nutr 67: 1108–10. Retrieved August 4, 2007. Rajakumar, K. 2003. Vitamin D, cod-liver oil, sunlight, and rickets: A historical perspective. Pediatrics 112(2): e132-135. PMID 12897318. This page was last modified on 13 July 2015, at 21:43.